Several of the articles which appear in this section of the web site have some association with my maternal grandfather, George Cook. My sister and I knew him only during his later years. My memory is of a charming and gentle man. I do not ever recall him stirred to anger or dark moods despite the loss and disappointment that he must have endured during the early part of his adult life. It is now appropriate that I bring all these strands together along with some new photographs taken on a recent trip back to Leicester. Despite the major demolition and reconstruction that has occurred in the West End of the city over the last quarter of a century many of the places mentioned are still there although their function may well have changed. 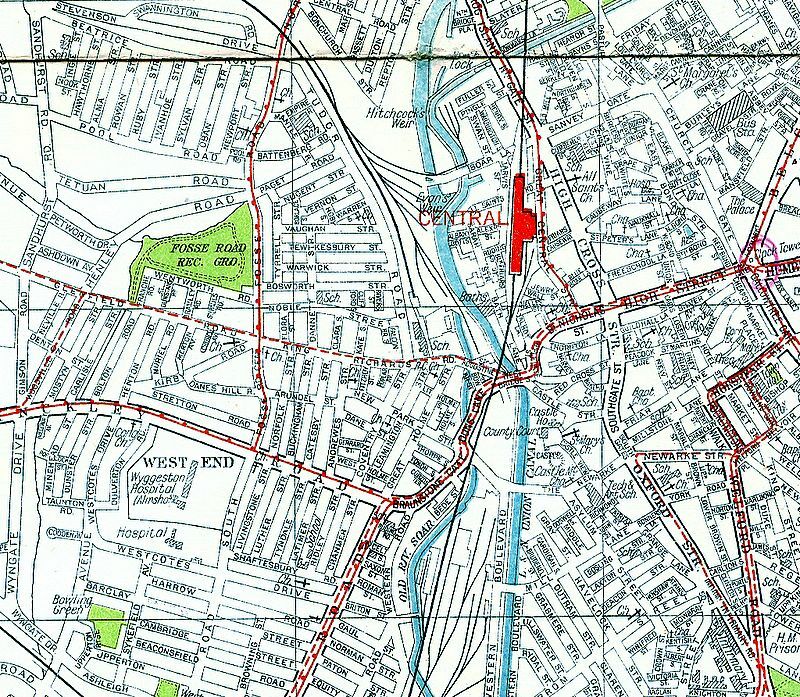 For ease of reference I have added a map of the area as it was around 1950. 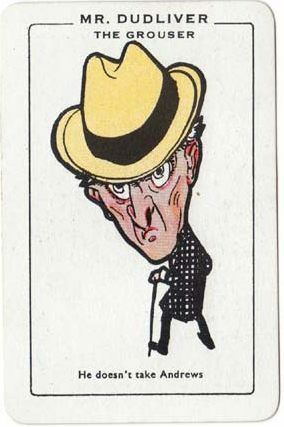 George Cook was born on January 12th 1883, the third child of Walter and Elizabeth Cook. Walter came from an agricultural background and originated in Grandborough in Buckinghamshire. 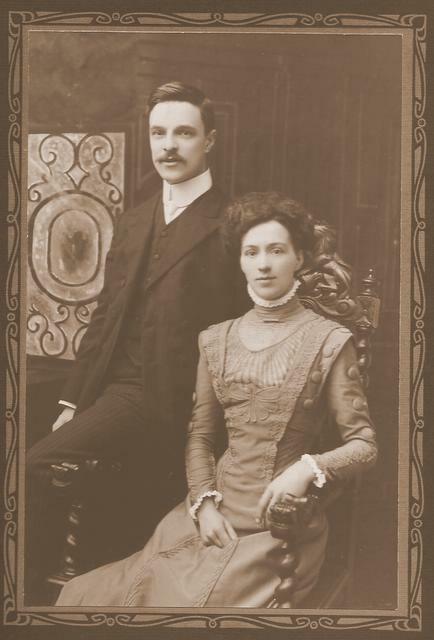 He met his wife, Elizabeth Burditt in Lubenham, Leicestershire and they married in November 1874. George ultimately had four sisters; two older and two younger than himself. 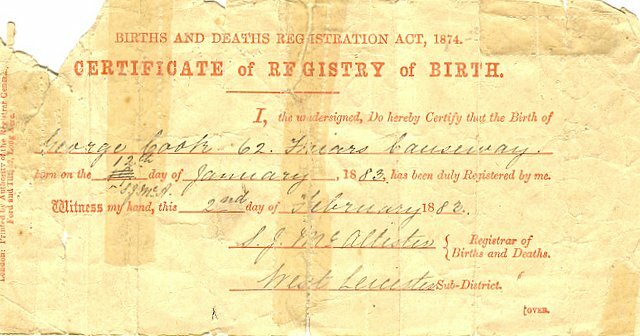 The 1881 census for Leicester shows that his father was employed as a waggoner and the family lived at 62 Friar’s Causeway in the town. Details of his early life and schooling are very limited. By 1901 Walter had been promoted to the post of foreman stableman. 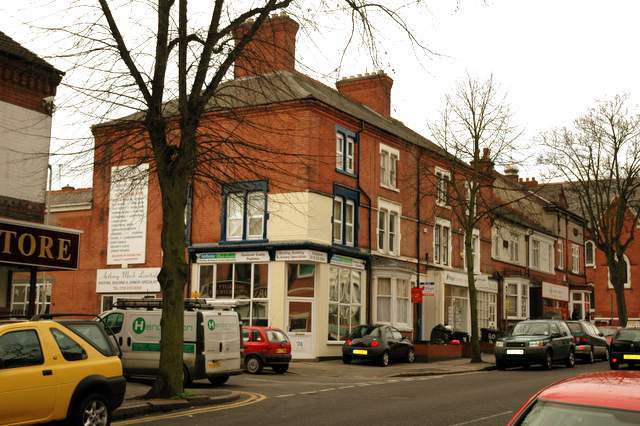 The family had moved to Tudor Road in the West End of Leicester – an area which was to become the centre of interest for the next three generations. By this time the eighteen year old George was working as a Grocer’s warehouseman. 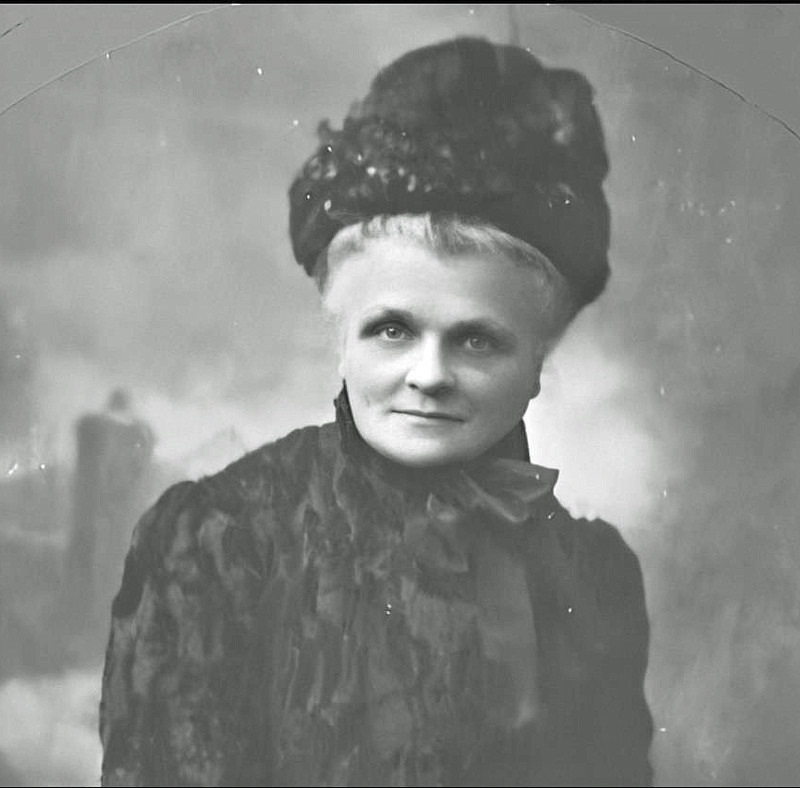 The household had also grown to accommodate Elijah Benson (later to become his eldest sister Jessie’s husband) and Nellie Youle, an orphan who was raised and schooled by the family’s collaborative efforts. Even in these early days we are aware of two influences that were to follow George throughout his life. He was a regular churchgoer in the Methodist tradition. He also loved light classical music and was to develop a passion for the operettas of Gilbert and Sullivan. One memento of his which has survived is the souvenir programme of a performance of ‘The Mikado’ given by the Leicester Amateur Music and Dramatic Society at the Royal Opera House in Leicester in 1904. It is impossible to be certain but we like to think that it was the spur that led him into performance himself and ultimately to become the Company's lead tenor. 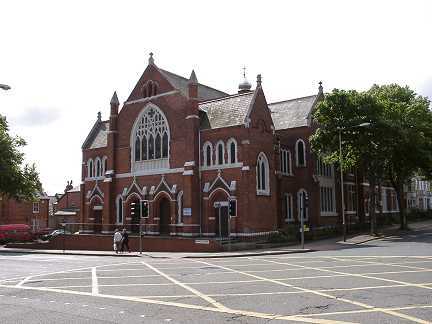 It is known that he was an active member of the choir at the Curzon Street Methodist Chapel in Leicester. He married Miriam Naylor on September 11th 1909. 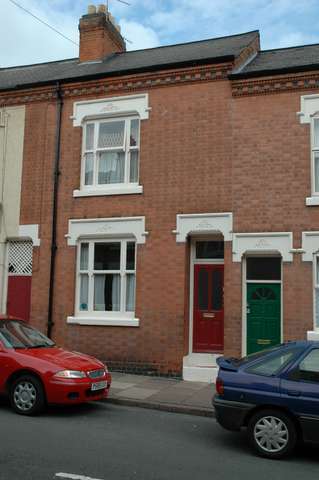 By this time the family was living in a terraced house in Bosworth Street, Leicester – a street which linked Fosse Road North to Tudor Road. Miriam’s family haled from the South Normanton area of Derbyshire and her father had been the manager of a colliery. She was the youngest of nine children (she had seven brothers and a sister, Mary). The 1901 census places her with her sister and husband, William Ball, in Stretton Road, Leicester. At the time of the wedding she lived in Westcotes Drive and was working as a draper’s assistant. 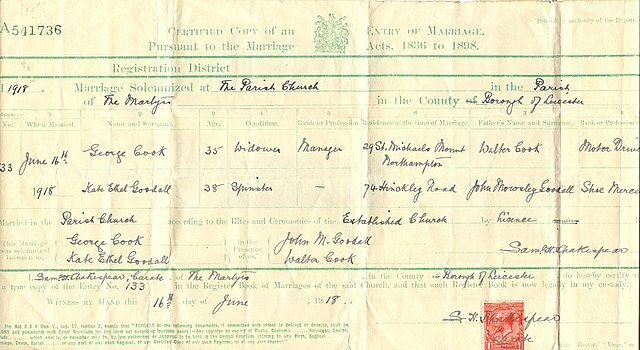 The ceremony took place at Hinckley Road Primitive Methodist Chapel on the corner of Hinckley Road and Fosse Road South. It was witnessed by her oldest brother, Joseph and his youngest sister Elizabeth. 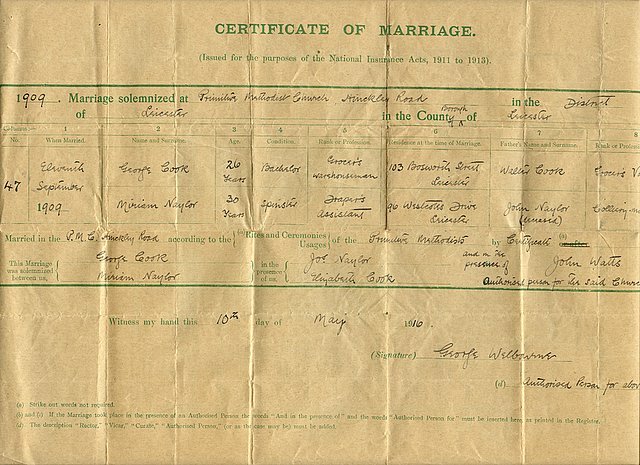 Married life appears to have been happy and suited George until tragedy struck in 1916. Miriam died of puerperal fever five days after giving birth to their only child, Hilda. The subsequent events are hazy but for whatever reason, Hilda was sent to live with and was raised by Miriam’s older sister, Mary, and her husband, William Ball (a school master) first in Westcotes Drive and then in Oadby a village on the southern outskirts of the city. 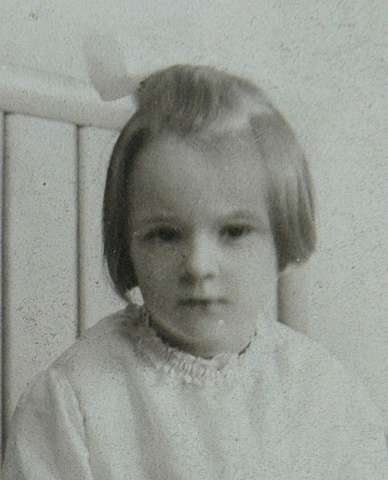 Although there is some evidence that she did have contact with her paternal relations (this picture was found amongst a photographic collection of George's sister, Annie's, children), most of her associations were limited to the maternal side of the family and she did not see her father again until she was into her twenties. 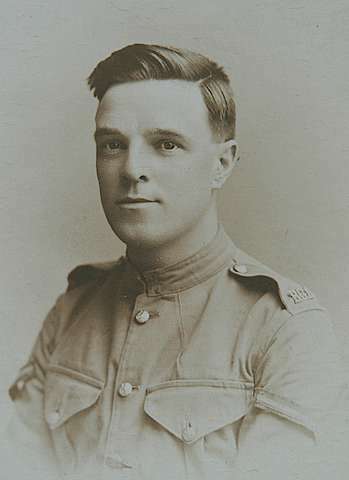 George enlisted into the Army during World War One and saw service on the island of Malta. Upon his return he lived initially in Northampton but maintained his links with his family and the City of Leicester. He achieved a post of manager in a shop. He met and subsequently married Kate Ethel Goodall, the daughter of a merchant who lived at 74 Hinckley Road. The family also owned a popular and well-known grocery store lower down the same road opposite the end of Andrewes Street. The wedding took place at the Church of the Martyrs, Westcotes Drive on June 16th 1918. It was during the 1920s that his musical career blossomed with the Leicester Amateurs. He had a fine tenor voice and a penchant for acting. 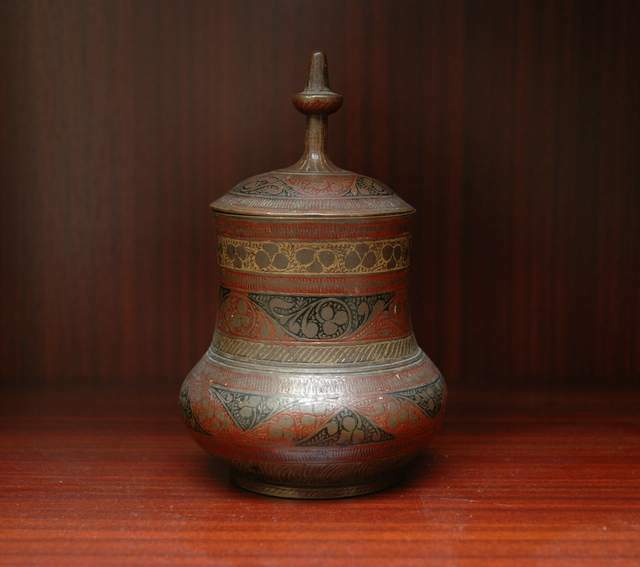 It has been said that he was on the verge of turning professional. He took the leading role in most of the Gilbert and Sullivan titles – and this has been documented and illustrated elsewhere in these pages. He and Ethel had no children of their own. It was many years later that Hilda learned that he was to sing at a concert in Northampton where she was living at the time and she often spoke of the emotional reunion when she met him afterwards for the first time. In the 1930s, he was grocer and subpostmaster at the Post Office at 87 Sibson’s Road in Birstall. By 1939 they had been joined by Hilda, who was now working as a jeweller's assistant. In his retirement George and Ethel moved to the suberbs - to Westover Road, Braunstone - with their corgi, Prince. The estate was some miles further west along Hinckley Road than his familiar haunts in the West End but he maintained his family contacts and shopped at Goodalls regularly, visiting by bus. 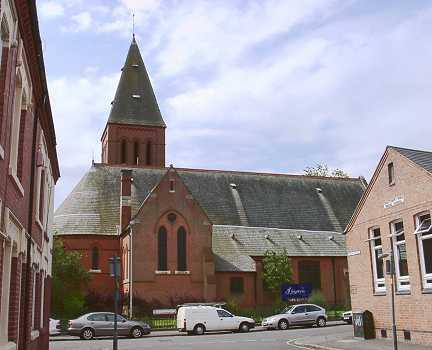 He remained a regular churchgoer at the Trinity Methodist Church and attended the local Fireside Social. He delighted in the touch and feel of books. 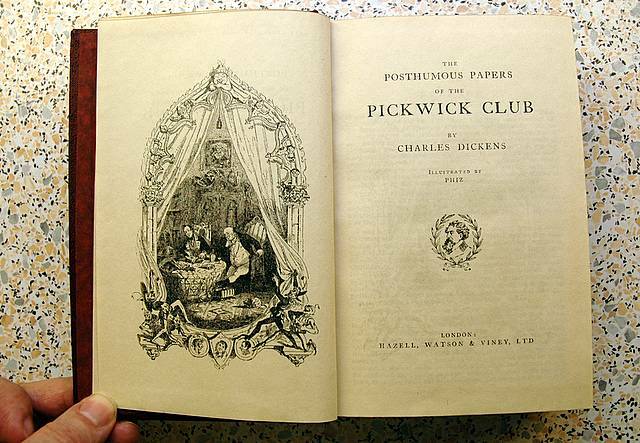 He was an avid reader (Victorian fiction, Biblical tracts, detective novels) and would sit for hours oblivious to happenings in the world outside or the passage of time. 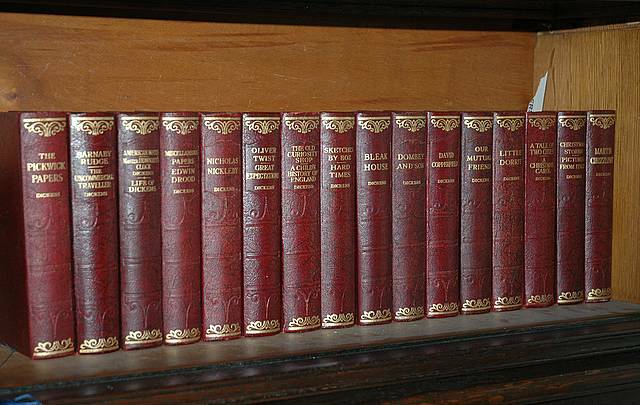 A prized possession was a set of the leather bound novels of Charles Dickens - 16 in all, illustrated by Phizz - from an edition published in the early 1930s. 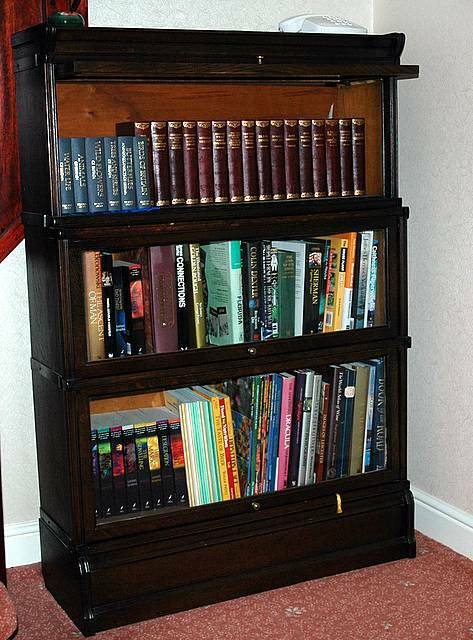 His books were housed in an antique Waring and Gillow drop-front bookcase. He was notoriously hard on the volumes and many a book would be cast aside with a broken spine. They had a large garden with a lawn that sloped down from the back of the house to a more rough area that contained a small stream. There was always something of simple interest going on outside when it was fine (a bonfire at the bottom of the garden, a game of quoits or clock golf on the lawn). 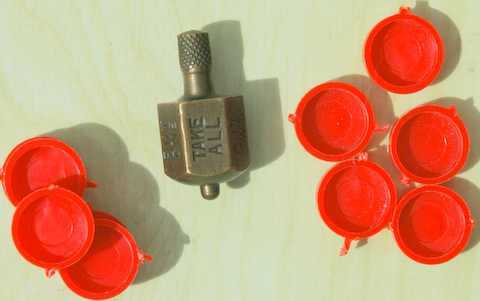 On wet days we would play “Put and Take” – a game which involved winning or losing counters depending on the turn of a funny little spinner – or Merry Andrews Happy Families (3) (no-one ever wanted to collect Mr Dudliver!!). Those were the days of medium sweet sherry served in tiny glasses at eleven in the morning, Nuttall’s Mintoes and Fry’s Five Centres. 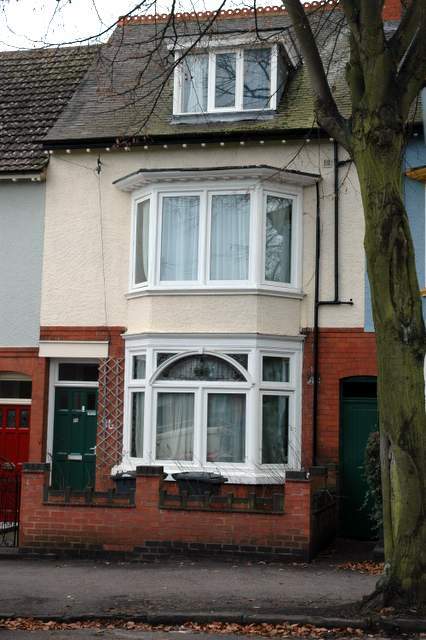 In the early 1960s travel became something of a chore and so they moved again to a terraced house (not far removed from the archetectural style of Bosworth Street) in Bruce Street, a quiet side street off Narborough Road not far from Westcotes Drive. They had almost come full circle. Entry from the street was directly into the front room. Access to the upper floor was by a steep staircase from the living room hidden behind a door. 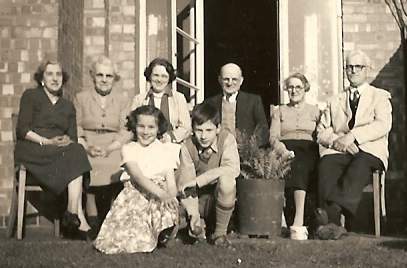 In the middle 1960s, Ethel died following a fall at home in which she broke her hip. George gave up independent living after that and went to live with my parents on Fosse Road North after I had moved on the University. He died of a coronary thrombosis in the summer of 1968. He was on his way to a holiday in the West Country. The study of genealogy frequently throws up interesting hints, false trails and blind alleys. There is the possibility of a link (as yet unsubstantiated) between the Goodall family of Leicester and the Goodalls of London which included several well known artists and painters of the Victorian era. If this does indeed prove to be the case, it will be even more remarkable that W.S. 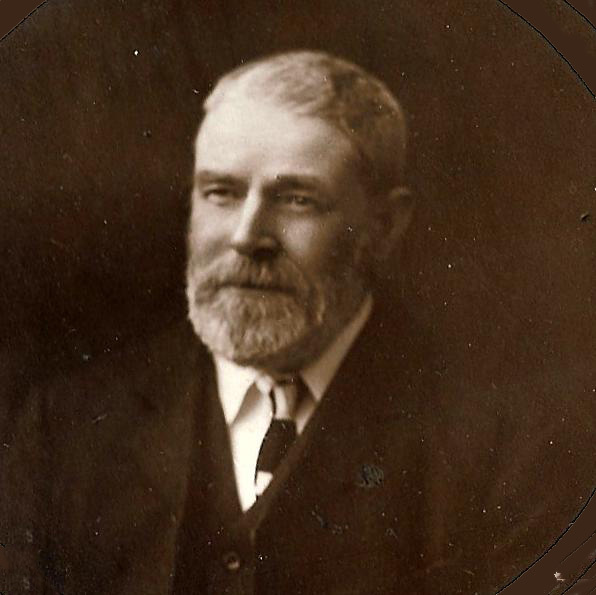 Gilbert (my grandfather's idol) bought his house "Grim's Dyke" from Frederick Goodall R.A. in 1890. I was lucky enough to find an unused pack of Merry Andrews Happy Families offered on eBay recently. Although the packet itself was a little weather-worn, the cards themselves were in pristine condition. 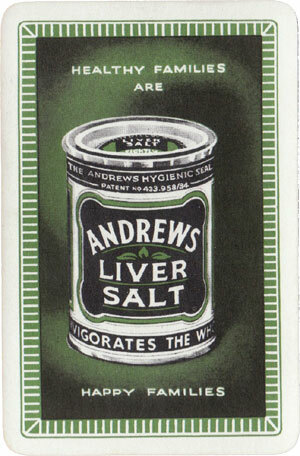 Published in 1936 by Scott & Turner Ltd., as an advertisement for Andrews Liver Salts this is a wonderful souvenir of Christmases and family festivities of days long gone and maybe a small memento to pass on to my own grandchildren!